Many of you have asked for a simple Guide or Analysis for GUN TRANSFERS…so we put together a one-page guide we hope helps answer many of your questions in one easy document. The document is designed to speak to both Title I and Title II firearms. It gives you a brief description of how to analyze a transfer of any kind under federal and state law, and to highlight what is involved and whether this is something you should consider further. While the document isn’t intended to give you legal advice, it is hopefully helpful in guiding you to make the right decisions for you personally. We would highly recommend you consult with a NW Gun Law Group attorney if you have any questions or want to see how it personally applies to your particular situation. Everyone’s situation is different so it is always helpful to see how these will impact you and your situation. 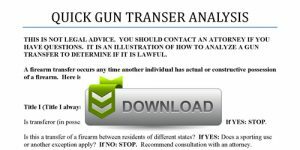 You can find the information on how to get a copy of the Analysis for yourself by going to GunLaw Community and visiting our page, 2016 Quick Gun Transfer Analysis. Please let us know in the comments below if this is helpful and if you would like to see additional resources like this made available to you. ← ATF Rule 41F is Here… and somebody slammed my gun trust!